Curry and tandoori chicken highlight the rich spices and flavors of the Indian cuisine. 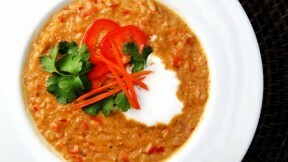 Choose one of our Indian recipes and expand your palate. This chicken coconut curry soup recipe is a quick and easy soup to keep your kids full and satisfied from Alice Currah of SavorySweetLife.com. See the full post at Kitchen Explorers.